Whether you live in Arlington, Virginia or anywhere in Northern Virginia for that matter, curb appeal, security, and privacy are undoubtedly important to you. These are all qualities homeowners look for in a home. These are all qualities that can help increase home value. But you know all that. What you don’t know if how to achieve curb appeal, security, and privacy with one affordable home improvement project. 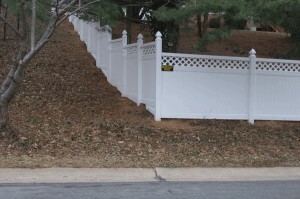 Since 1955, Hercules Fence of Northern Virginia has been providing professional fence services and installation throughout Arlington and the rest of Northern Virginia. We take great pride in our work and can handle all of your winter fence installation needs: Custom Wood Fences,Ornamental Steel Fences, Ornamental Aluminum Fences, PVC Vinyl Fences, Chain Link Fences, and more. Plus, as the largest fence company based in Northern Virginia, Hercules Fences has the ability to buy fencing products you want at a price you’ll love. That’s what we call a win-win! The right fence can add greatly to your home’s curb appeal. Just think about it. What is the one common denominator in all of the best looking homes in your neighborhood? Fences! They are like picture frames for your yard. Now you wouldn’t hang a picture without a frame, right? There are 15,365 property crimes annually in Arlington, Virginia, according to neighborhoodscout.com. These crimes include burglary, larceny, theft, motor vehicle theft, arson, shoplifting, and vandalism. The high rate of crime has earned Arlington a crime index of 10. To put this into perspective, 100 is the safest. A strong residential fence can help deter theft, vandalism, and countless other crimes. If you have any questions about Residential Fencing, please contact Hercules Fence of Arlington , Virginia today by calling (703)551-2609 or visiting our website. Also, check out Hercules Fence of Manassas on Facebook,Twitter, Google+ and YouTube! This entry was posted on Friday, January 23rd, 2015 at 12:32 pm. Both comments and pings are currently closed.